Authentic Barbour Classic Bedale Mens Coat. Mint condition as hardly worn. Fits like a Size 42. Husky fit. Condition is Pre-owned. Beautiful jacket with very little use as it is too big for my size 40 frame. Shipped with USPS Priority Mail. 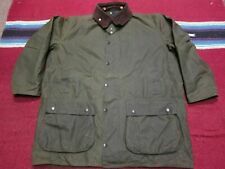 VTG Barbour Northumbria Waxed Cotton Rain Coat Jacket Olive C48 122cm XXL Mint ! Color: Olive green. If you are not used to it, or have doubts about whether this is acceptable. We do our best to describe every imperfection we can find. ➤ ➤ ➤ ➤ ➤ ➤. ➤ ➤ ➤PICTURES ➤ ➤ ➤. In excellent used condition as shown. It is probably bit more olive green than show in the photo. Just let us know of the item and the pricing. Rotor Bike, Keywin, Donnelly, Evoc Bag, Absolute Black Chainrings, Motorex, Skratch and Smoove Lube. This jacket features a stylish 2” horizontal baffle quilt for a twist on classic quilted jacket. This jacket features an array of pockets including lower welted pockets and an inner security pocket. Warm jacket Waterproof Insulated Pockets Great shape! ll bean womens quilted jacket Olive Coat S/m Barbour Style Preppy Euc. Shipped with USPS Priority Mail. Classic olive quilted jacket. Tagged medium, see pics for measurements. One small discoloration on sleeve. Otherwise flawless and ready for adventures. USA size M (ladies size 10 ). Very good condition, just buckle is missing on belt. The Tartan Helmsdale jacket from Barbour, featuring waxed cotton construction for strength of character and water-resistance. Color: Classic Tartan. Fabric: Inner: 100% Nylon, 2" box -Quilted Lining. Thanks for supporting our small business! Jacket is missing a button (pictured). Measurements: Size- Large Chest- 25” armpit to armpit Length- 32” collar to the bottom of the jacket Sleeve- 25” shoulder to cuff Shop with confidence as all of our clothing comes exactly as described. Barbour Brown Cotton Size 8 Twill Newmarket Jacket Coat Waterproof Women's. Condition is Pre-owned. Shipped with USPS Priority Mail. Plaid interior. Zipper and button closure. Good used condition. There are small tears at the corners of the pockets, see photos and use the zoom tool. This does not affect the functionality of the coat. Model: Cotton Sapper Jacket Coat Quilted Lining Navy Blue. Make: Barbour. Barbour Medium Lord James Percy Northumberland Range Green Dunmoor Jacket Coat. Condition is Pre-owned. Shipped with USPS Priority Mail. Plaid interior. 2 large/2 small front pockets. Zipped interior pocket. drawstring waste. Slight rubbing on interior right side. Rub/burn mark on right sleeve. A belted collar refines a classic diamond-quilted jacket that's roomy enough for warm winter layering and stylish enough for the city. -Machine wash, dry flat. -Sleeve: 26". -Back length: 31". -Long sleeves with three-button cuffs. A great quality jacket from Barbour. Hardly used. Detachable hood, four outside pockets and one internal pocket. Wool lining in original Barbour tartan and a two way zip.